OFG (French Origin Guaranteed), a quality assurance. Galvanised inside and out for long-lasting protection against rust. At All Round fun, we stock all the childhood favourites, getting your children out into the garden and into the fresh air. Our selection of Swings, Slides and Seesaws can turn your back garden into a fun adventure land for your children to enjoy. All of our Swings, Slides and Seesaws provide children the opportunity to enjoy themselves whilst getting that all important exercise. 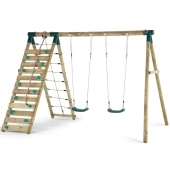 Every product that we stock comes from trusted suppliers and has been subjected to extensive quality control and testing, assuring you that you children will be safe playing on a Swing, Slide or Seesaw from All Round Fun. We stock both two person and four person Seesaws for children of various ages; available in both colourful metal and wooden finishes. 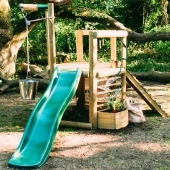 Chances are we stock the Seesaw that perfectly complements your back garden. Our extensive Swing selection range from small one person Swings, to large play fixtures that accommodate a whole troupe of children. Our more deluxe Slides even incorporate built-in play areas for children to enjoy. 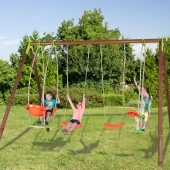 With Swings available for all budgets and family sizes, all children can soon be enjoying the exhilarating back-and-forth motion. 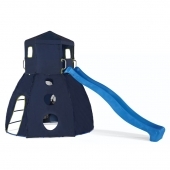 Stocking Slides from respected brands such as Little Tikes and Smoby, we can help you find the fun and functional slide for your back garden. Children can be enjoying the thrills and spills of sliding on our fun, colourful, simple-to-construct Slides.